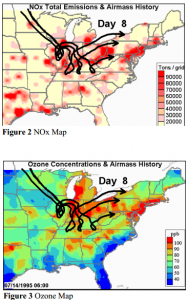 Nitrogen dioxide is found near roads and in cities. City dwellers are more susceptible to coughs and sneezes so nitrous oxide has become the scape-goat. Consequently monitoring stations have sprung up, those mysterious grey or green cabins set a few metres from the road with a tube sticking out of the top These robots constantly monitor this gas and send information alerting authorities when nitrous oxide levels are high. Presumably those individuals who are susceptible to asthma can stay at home until the scare has passed. Nitrous oxide levels are falling due to the rats nest of pipes found under the bonnets of modern cars which effectively suffocate our engines. These pipes reduce the quantity of fresh air sucked into our engines by diluting it with the exhaust. Effective though this arrangement is at preventing nitrogen dioxide emissions, more fuel has to be burnt to overcome the fact that there is only just enough oxygen in the engine to burn the fuel. This system works well enough on new engines but exhaust gas contains a small percentage of ash and carbon. Inevitably this clogs up the pipes which are supposed to reduce the engine’s emissions. The result? lower engine efficiency, more soot from the exhaust pipe and more carbon dioxide being released. 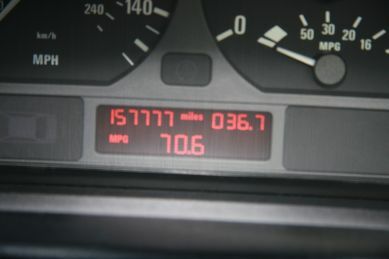 A driver can detect this loss of performance after a car has travelled a high mileage. Some of those in the tuning business who operate dynamometers have the view that road cars can lose power after just 20,000 miles and this causes a commensurate increase in fuel consumption. Unfortunately manufacturers only need to ensure that their cars meet strict standards emission standards when new. The promulgators of the regulations, I feel have not taken the bigger view that the emissions produced in a cars lifetime should be more important. Research on new vehicle emissions is easy pickings. Regulations should really be based upon real life vehicle use and not centred around nitrogen dioxide simply because its concentration is easily monitored. Nitrous oxide does not build up in the atmosphere. It is too soluble and unstable. It is found in higher concentrations in cities where it is blamed for chest infections. I have always been under the impression that infections were caught from other people. Cities have a high concentration of people. Could this be the main reason for chest infections in cities? It is thought that youths started a huge forest fire which decimated a large area of woodland to the south of Bracknell. 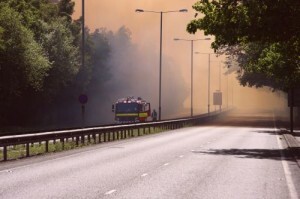 Over a hundred fire engines, together with helicopters were employed to fight the blaze. Traffic was disrupted as miles of roads had to be closed for days and bus routes had to be suspended. Fortunately no lives were lost, although the financial costs of fighting the fire, plus the costs to businesses disrupted by the incident were huge. Those youths who allegedly started the fire proved to be an immense drain on the community.